[XPB-66016-X] Our Metal Box Bridge Locker Units with Windows configuration is designed for 16 users and utilizes only 69" of floor space. 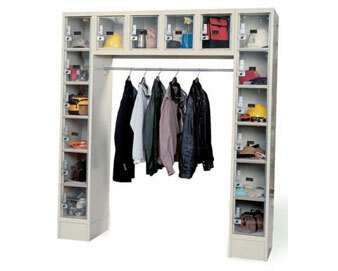 Locker units are constructed in heavy gauge steel and includes a coat rod. Doors include a friction catch latch, louvered door for ventilation and number plate. Latches will accept built-in locks or padlocks. Lockers are available K.D and require assembly. Assembly available for an up-charge and requires more lead time for delivery. Specifications and detailed information available upon request. For pricing, shipping quotes, orders or questions please call our Customer Service Center at 1-877-483-9270.